FIGS. 34-37. Seedlings of Dracontium. 34. D. changuango G. S. Bunting (Aristequietae 12734, photo by Thomas Croat #956-28), seedlings developed from tubercles are sagittately lobed. 35. D. gigas (Zhu 1156), same as previous figure. 36. D. plowmanii G. Zhu (Zhu 1447), seedlings developed from tubercles are sagittate. 37. 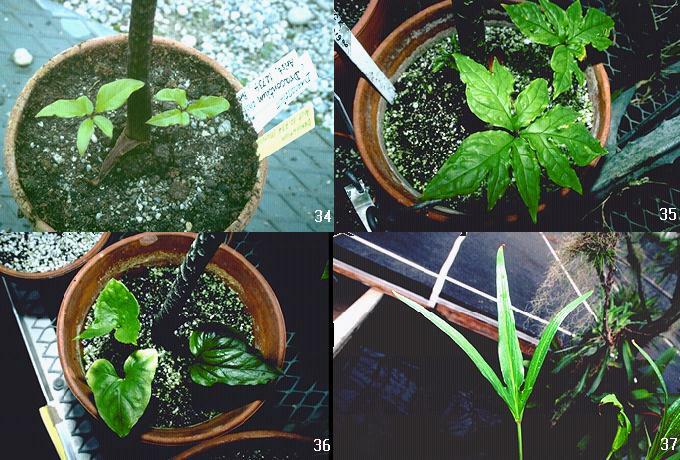 D. margaretae Bogner (Zhu 1533), demonstrating trifid seedlings commonly developed from tubercles.